When baby loons are just a few hours old, they must already instinctively know who their parents are and how to follow them, how to swim, how to beg for food, what to do when they hear their parent make a warning call, and how to climb up on their parent's back when they get tired or cold. Fortunately, they know all these important things instinctively. When any baby bird hatches, it can't regulate its body temperature at first. It takes several days for baby loons to be able to stay warm on their own. For several days, they swim only for short periods and then climb back up on their parent's back. Their thick down feathers keep their skin dry, but they still get chilled pretty fast. Doesn't it seem like robin babies must stay warmer all snuggled under their mother in a cozy nest? Actually baby loons get just as much warmth from riding on mom or dad's back! It helps that baby loons have great big feet! How can this be? 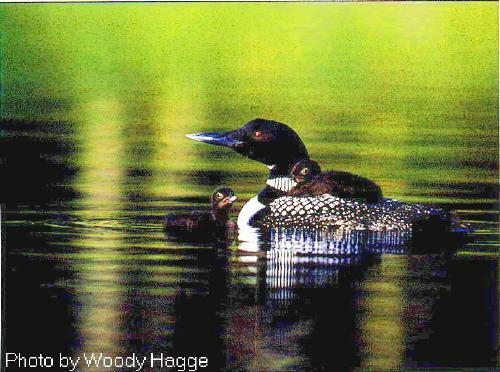 Loon parents leave their babies sometime around the time that the babies are 11 weeks old. At that point the baby loons can't fly yet. They will have to learn many things all by themselves: how to fly, how to find all their own food, how to protect themselves against predators, and how, when, and where to migrate. Sometimes people think it's cruel of the parents to abandon the babies like this. But there is a very good reason for it. Loons can't walk on land. Before the babies can fly, they can't leave their lake, even if the lake runs out of food. So the parents leave in order to ensure that there will be enough food remaining for their precious babies. How can baby loons get as much heat when riding on their parent's back as baby robins do when being brooded in their nest? And what does keeping warm have to do with the big feet that baby loons have? After your class talks this over, compare your answers with ours. List as many items as you can think of for each column. Then think of at least four differences between loons and ducks that help explain why ducks must lay so many more eggs than loons. After you've finished, compare your answers with ours.